Feeling nervous about the economy and looking for more ways to save money? Cooking at home, instead of eating out, is one solution. Not only is it generally less expensive to eat at home than to dine out, but often food that you prepare in your own kitchen is healthier because you control the amount of fat, sugar and salt used. It can take more time to be frugal, but if you can save time and money, that's a plus. Here's a way to do both. This weekend, set aside an hour to prepare baking mixes that can be used for entrees and desserts. This way, you control the ingredients (eliminating some unpronounceable ones) and cut back on packaging for which you pay a premium. Making a basic dry mix that's the base for a variety of baked goods is a concept that's been around for a long time. So have one-skillet meals. But combining the two to create BakeOvers is the idea of MaryJane Butters, founder of MaryJanesFarm magazine and website. MaryJanesFarm offers a line of organic fast food, including Farmhouse Cuisine mixes, which Butters uses to make BakeOvers. With one non-stick skillet that is rounded and deep (like a wok), you can make a variety of one-dish meals. Here's her concept: After you've chopped or sliced the vegetables or fruit that you want, you sauté them (3 to 5 minutes) in a skillet and place one of her mixes or "lids" on top like a pie crust. Place the skillet in the oven for 20 minutes, and when it's done, flip the contents upside down onto a plate and serve the BakeOver. If you eat dairy or meat, you can add grated or cubed cheese, fish, tofu or any boned meat to the vegetables. To the fruit, you can add a layer of cream cheese. Pick your favorite fruits and vegetables and be creative, Butters said, because with her program, they all work. The proportions are simple. 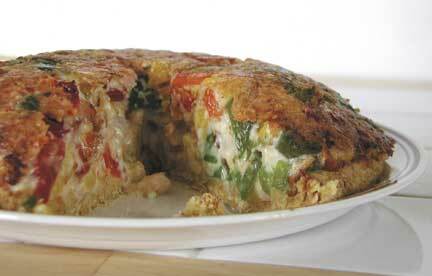 The one-skillet rule is 4 cups vegetables, 2 tablespoons butter or oil, and quick baking mix. For desserts, it's 4 cups fruit, 2 tablespoons butter or oil, and quick baking mix. Ideas for one-skillet meals or desserts are endless. We found recipes for baking mixes, then we added a few touches to make them cheaper than buying a ready-made mix. King Arthur Flour has recipes for making mixes that can be stored for weeks in the pantry. When you're ready to use it, simply add milk or water. The mixes can be seasoned with your favorite flavors, including chili, taco or Cajun seasonings; can be sweetened with sugar; or can be combined with nuts, dried fruit and spices. The idea also can be used to make a brownie mix. Other ideas are available at www.maryjanesfarm.org and www.kingarthurflour.com.